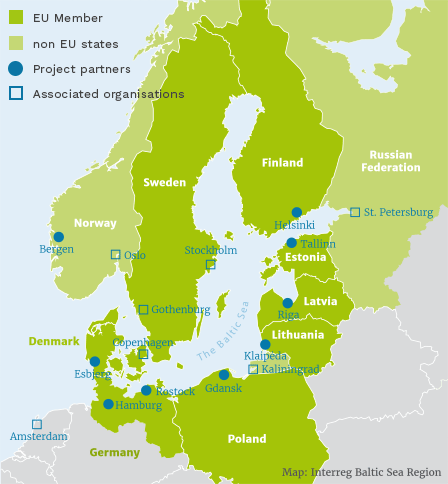 GREEN CRUISE PORT (GCP) is a project in the EU Interreg Baltic Sea Region Programme 2014-2020. GREEN CRUISE PORT elaborates a multidimensional strategic approach for a sustainable and qualitative future development for cruise shipping in port areas. GREEN CRUISE PORT encourages investments and procedures in environmentally friendly cruise port infra- and superstructure in the Baltic Sea Region (BSR) as well as in smart traffic links to the public transport and supply systems. GREEN CRUISE PORT has been implemented from March 2016 to February 2019. GREEN CRUISE PORT embraces 20 partners, incl. associated organisations, which represent port authorities, cruise lines, a maritime research institute and a governmental body. Geographically it covers all BSR countries and the neighbouring North Sea.